Have you ever wondered what it is like to live in the Biblical times? 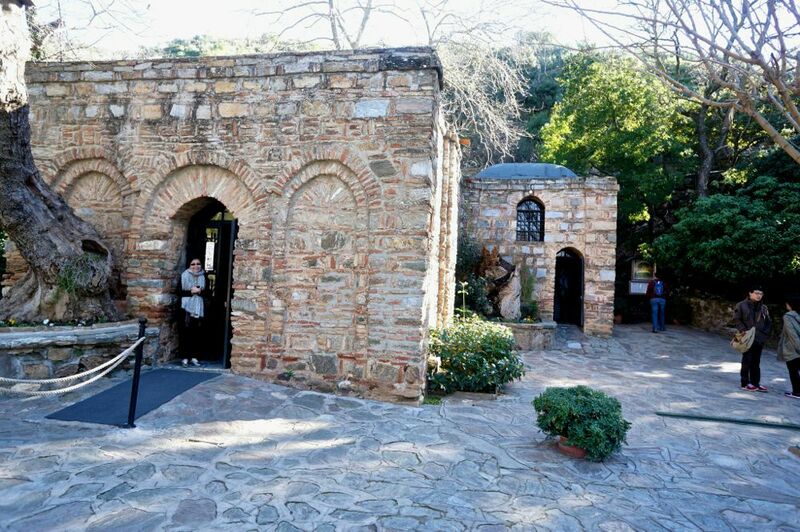 To be in Ephesus and listen to St. Paul and St. John or visit Mary in her house? 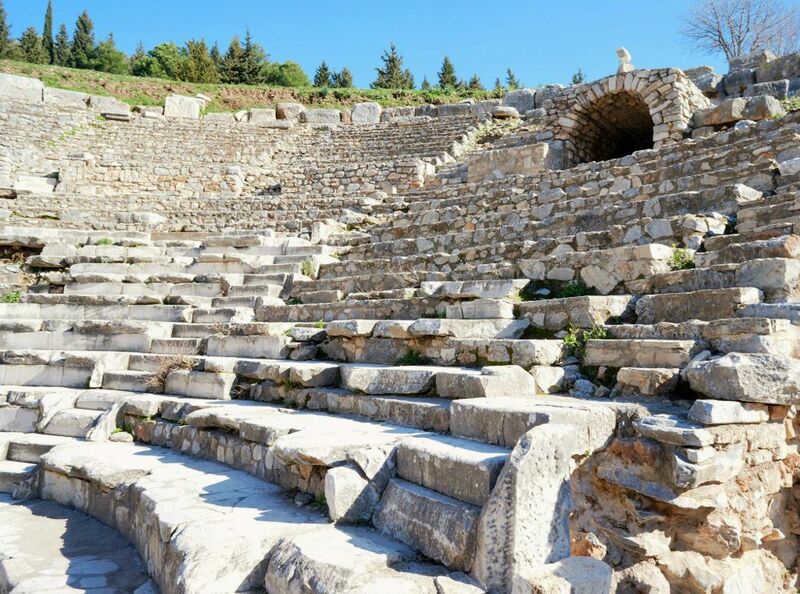 Sitting close to the Aegean, Ephesus has the answer. As a major port, it became the center of trade and culture occupying a place of significance in the Bible. So, while the great Easter crowds fill Israel to overflowing, a more peaceful way to think of Jesus, Mary, St. John the Apostle and St. Paul and also the early Christians who lived and came through this city is to come to Turkey and walk through this Valley. The Library of Celsus. Source: aesta1. Ephesus is now about 5 miles from the Aegean Sea but it used to be a major port so the city went right up to the water. What happened? The silt from the Cayster River kept changing the shoreline that brought Ephesus inland. Now, it lies between two great rolling hills and the beautiful valley is as peaceful today as it was two thousand years ago when Mary, Jesus' mother lived there. My husband and I visited and the place fascinated us no end. Ephesus is blessed not just with some of the most beautiful scenic landscapes in the world but also with a great and complex history. The remnants of this history, scattered throughout the Ephesian valley, enhance the beauty even further. The Acts of the Apostles talk of this famous city in antiquity. As an important city, Ephesus has been the seat of several 5th century Church Councils: First Council of Ephesus in 431, Second Council of Ephesus in 449, and Third Council of Ephesus in 475. It is also believed that St. John might have written his Gospel here. In fact, Ephesus is one of the 7 churches cited in the Book of Revelation. The Library of Celsus is the most beautiful of the preserved buildings. 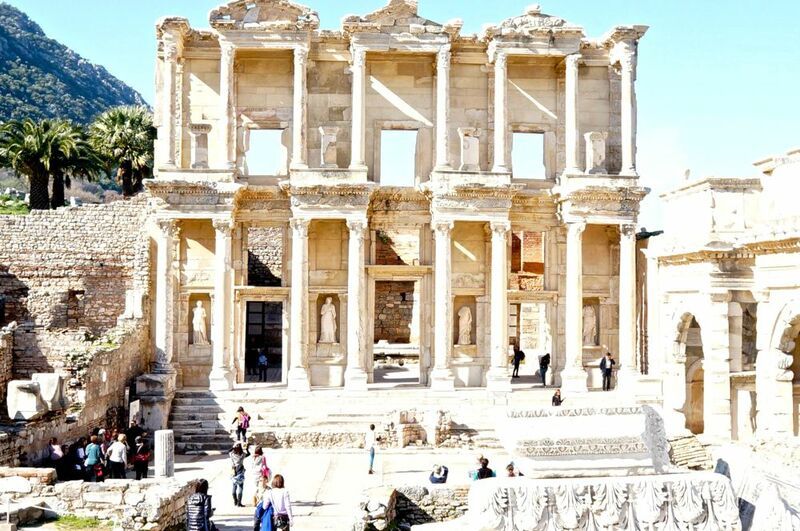 Built in 135 to honour Celsus, the governor of Asia Minor, this was the third largest library of ancient times. ​It was said that when Cleopatra visited here, she was so impressed with the collection that she asked for these as a gift from Mark Anthony. The collections were transferred to the Library in Alexandria and perished when the library got burnt. I admired how well preserved it still is. Imagine the ancient records that were kept here. The Library of Celsus is at the center of the ruins of the ancient city of Ephesus and this place alone would take days to contemplate. One can come here and think of the early Christian times when those who first believed had to spread it in caution, at the risk of losing their lives. Ephesus offers the best picture of life in the ancient Greco-Roman world. In this street are beautifully laid out mosaics showing the advanced way of life of the people in Ephesus at that time. This is one of the best preserved of the mosaics and we are lucky to still have it. You can still see the design. Just imagine the streets paved in these mosaics. On this road, paved with granite and decorated with statues of famous people at that time, Mark Anthony and Cleopatra and other ancient names we have read in history have walked. But the centre of life for this ancient, you will never guess. It is not a Cafe. It is the Latrine. Men send their slaves to warm the marble seats and then, they take over more to socialize with their friends and share the news of the day. As you stroll through the ruins, have a peek at how beautifully adorned the houses then of the rich in Ephesus. Excavations are still going on in this area and more will be displayed in the future. In these streets, I imagined St. Paul and St. John walking. It seems Timothy was also here. Maybe, even Mary, the Mother of Jesus, must have visited this place or maybe lived here. The early Christians, some called themselves the Pauline group or the Johannine group, even the Nicolaitans, certainly lived in this city. Most of the people at that time, though, worshipped Artemis. Their constant refrain was "Our God is Artemis". For the Christians, we have a glimpse of these times in what Paul wrote to the Corinthians: We do not want you to be uninformed, brothers, about the hardships we suffered in the province of Asia. We were under great pressure, far beyond our ability to endure, so that we despaired even of life. Indeed, in our hearts we felt the sentence of death. But this happened that we might not rely on ourselves but on God, who raises the dead. He has delivered us from such a deadly peril, and he will deliver us. (2 Cor 1:8-10). 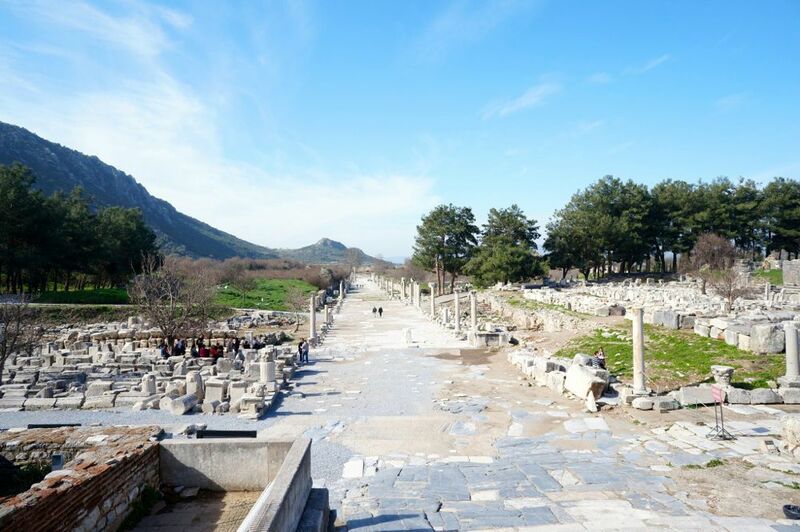 Ephesus, with a total population reaching about 225,000 at its height and mostly worshippers of Artemis, became a place for many early Christian missionaries like St. John and St. Paul to preach their new belief. As the letter to the Corinthians clearly underlined, St. Paul was committed to getting a strong following in the area. ​The fact that Ephesus had been a strong follower of Artemis (Diana) must have also challenged the early Christians. The Ephesians had inherited their goddess Artemis with glorious architectural commitment. They had built a temple to honour her which was larger than even the Parthenon. This single last upright remnant may not show much but the vast fields of tumbled marble bear witness to its size. Most of the finest carvings and statues are now in the British Museum and in Hagia Sofia. Paul's letter to the Ephesians had no mention of Artemis and so it must have been a generalized letter to all Christians. Perhaps, St. Paul was enough of a politician to try to avoid offending those whom he wanted to convert. It was in this very place, the big Theatre, that St. Paul preached. You can just imagine the many people who would have listened to him thereby getting the ire of the authorities at the time. He was imprisoned but because he was a Roman citizen, he was not killed but brought to Rome. 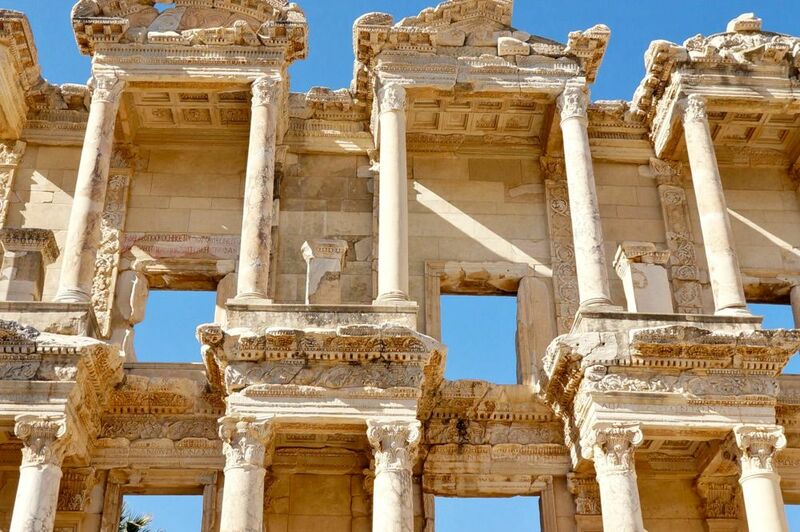 For Christians and non-Christians alike, Ephesus remains one of the most powerful memories of our history over the past two thousand five hundred years. St. John, the Apostle of Asia, is believed to have been buried here. There are records showing that St. John lived in Ephesus for a while. Jesus entrusted his Mother to John and so St. John brought her to live in this city and her house is now one of the most visited places here. No historical record could clearly support that Mary, the Mother of Jesus, lived here. But many believed that because Jesus entrusted his mother to John, John must have brought here here when he lived here. When you look at the picture, you can see the line where the old house ended. The upper portion is a later addition. Gregory of Tours first mentioned this place as being on top of a mountain near Ephesus. He wrote of the four walls without a roof where John lived. A group of villagers from Kirkince, a village about 17 km. from this place traditionally believed that it was from this place that Mary was assumed into heaven. So each Assumption Day, August 15, these villagers come here walking for five hours on pilgrimage. They claimed that this tradition has been handed down from generation to generation. The German seer, Anna Katharina Emmerich, saw the house of Mary in a vision which was detailed in the book of Clemens von Brentano on Mary. This guided the serious seekers, nuns and priests who have read the book, to find this ruined house with the mountain behind it and the sea in front. In 2006, there was a forest fire in the area. The fire was massive but as it approached the house, it suddenly stopped. Locals claimed there was no wind to blow the fire in another direction, there was no sudden rainfall, no natural reason for the halt in the burning. It just stopped. Our Turkish guide said the only explanation is that it was a miracle. Although the Church has not officially declared this place as the last house Mary lived in, several popes have said Mass here including Pope Paul VI, Pope John Paul II and Pope Benedict XVI. In the property is water from the redirected stream which many deem to be miraculous. Pilgrims drink this water believing this to have healing value. The Vision of Catherine Emmerich is in this book. Her account of her vision guided the search for this House of Mary which was finally located in this area. 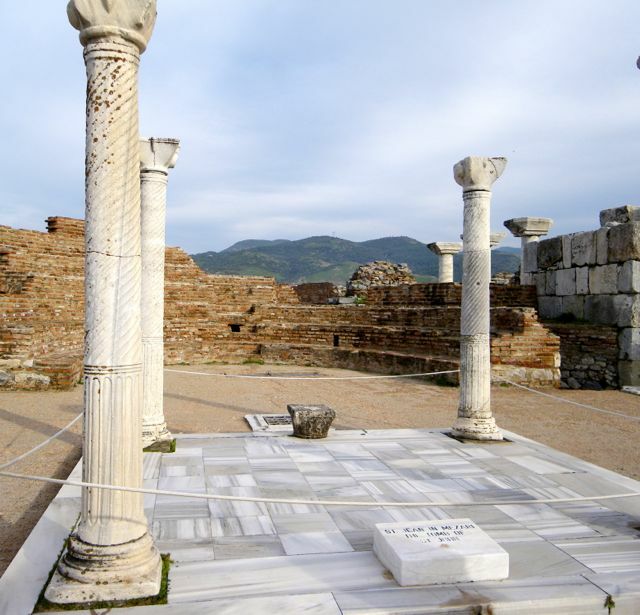 Ephesus is the best preserved of the ancient cities on the eastern shore of the Mediterranean. They are still excavating and restoring the place. So, for history buffs, this city is really exciting. For Christians, this would be an interesting pilgrimage to remember the early Christians and the world they were in. How did they practice their faith. How did they become believers of Christianity? How did they share this new belief with others? Reading this book reminded me of our guide's description of life in the ancient village. Set in an ancient Anatolian village, it could easily be describing the life in Ephesus at that time when Turks and Greeks lived in harmony though professing different faiths. ​The characters including the Aga in the village, the Potter, the Priest, the Imam, the Teacher, and even the blaspheming Beggar all made the story so interesting. What with these village characters coming to life in Bernieres' expert hand at the time when the Ottoman Empire was in decline and the growing passion of the revolutionaries to do something.